About 40 million years ago, Gabriola was formed by rising sea beds of sedimentary rock. The Island was later scoured by glaciers and battered by eons of wave action that sculpted the sandstone into the amazing shapes seen today. By 1874, seventeen settlers, many of whom had married First Nations women, were working the land and supplying food to Nanaimo. Later settlers quarried Gabriola’s abundant supplies of sandstone for use as millstones in pulp mills, and for construction in cities from Vancouver to San Francisco. From the 1890s to 1952, the Gabriola Brickyard was producing up to 80,000 high quality bricks a day, while the sheltered waters of Silva Bay were home to a fishing fleet, a lumber mill and a thriving shipyard that was the Island’s largest employer in the 1960s. 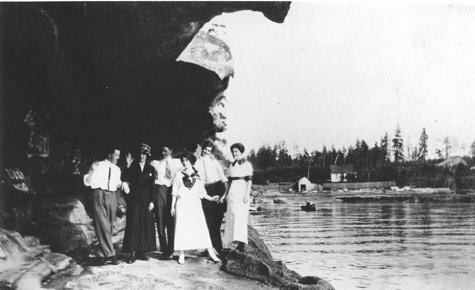 In 1950, Gabriola had fewer than 400 fulltime residents. Today the island is home to more than 4000, with many more residents in summer. —— Gabriola Island was home to the Snuneymux Nation for thousands of years. 1883 John Silva, a Portuguese sailor, settled on Gabriola with his Lyaksen First Nations wife Louise Hoiowaaat. 1919 The first community hall was built with free labour and materials, on land donated by the Shaw family, at the site of the present hall. Sunrise Lumber Company began operations in the Silva Bay area, but it was destroyed by fire in 1925. 1945 Withey’s Shipyard began building various water craft, until 1974. 1948 Gabriola population was 300. 1974 Islands Trust was created by the Province of BC. 1978 Gabriola’s first Official Community Plan was adopted. 1981 Gabriola’s first Zoning Bylaw was adopted. 1988 Sandwell Provincial Pard was dedicated. 1995 The new building for the Gabriola Museum opened. 1996 Gabriola’s population was 3,479. 1997 Petroglyph Park opened on the Museum grounds. 2006 Gabriola’s population was 4,050. 2008 Elder Cedar Nature Reserve was established. 2010 15th Anniversary celebration of the Gabriola Museum’s completion. 2011 Construction of a new community health clinic began, built entirely by volunteers. 2012 Gabriolans voted 57% in favour of constructing a new firehall.